Ephemeris for Earth Day, Monday, April 22nd. Today the Sun will be up for 13 hours and 49 minutes, setting at 8:36, and it will rise tomorrow at 6:45. 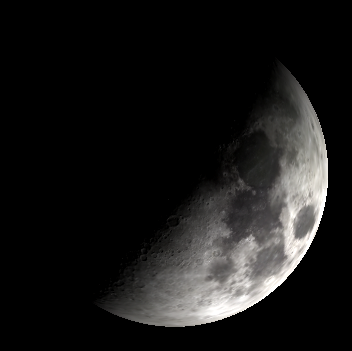 The Moon, 3 days past full, will rise at 12:24 tomorrow morning. A good slogan for this Earth Day or any day is “Support your local planet.” As an amateur astronomer I look around the solar system at all the habitable planets. The Earth is it. Mars may be terraformed at great expense, that is made more earth-like. 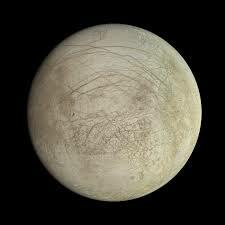 There may be life in the oceans of Jupiter’s moon Europa, or Saturn’s Enceladus, but they are not habitable for us. Terraforming (stopping and reversing climate change) the Earth would be the easiest and much more practical. One look at our nearest neighbor Venus will show us our fate, hopefully in billions of years from now, a hell hole of heat and a crushing atmosphere. 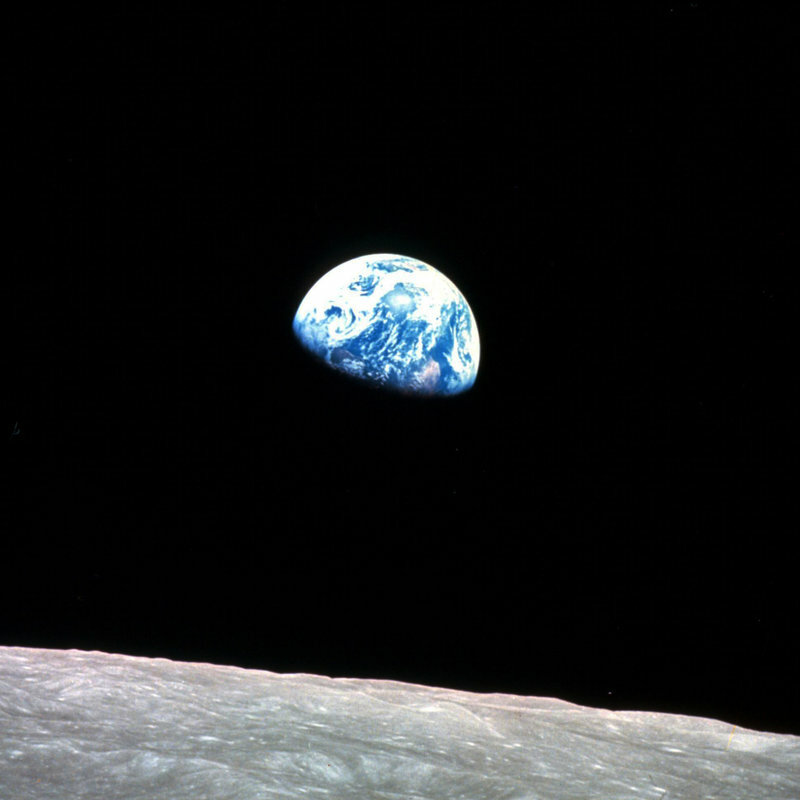 Our job is push-off that day as far as we can, and keep the Earth a blue-green oasis in the solar system. Mars had its day, but that ended about 3 billion years ago. Being half the size of the Earth, Mars cooled down, lost its magnetic field, so the solar wind stripped away most of its atmosphere and water. Credit NASA. Europa, one of the four Galilean moons of Jupiter and easily seen in small telescopes, is slightly smaller than our Moon. Under that thick icy shell lurks an ocean with more water than all the Earth’s oceans. There’s probably volcanic vents like the black smokers in Earth’s oceans where a whole ecology of extremophiles could live like they do on Earth. Credit: NASA. 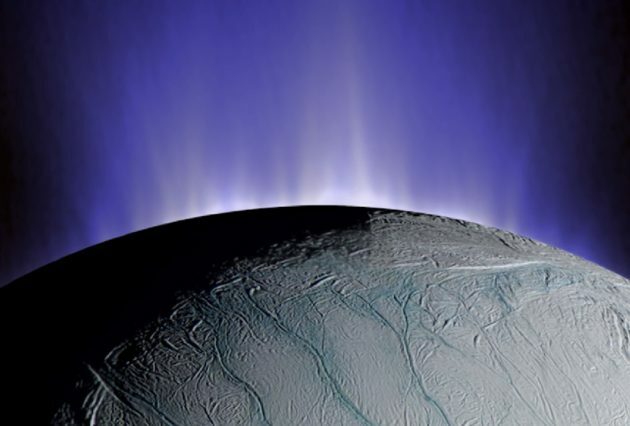 Enceladus, a small moon of Saturn spews continuous geysers of water from cracks in its south polar region indicating an ocean below its frozen icy exterior. Sampling the plumes with the right instruments may detect life on this small world without the need for drilling. Credit: NASA. Is this our future? 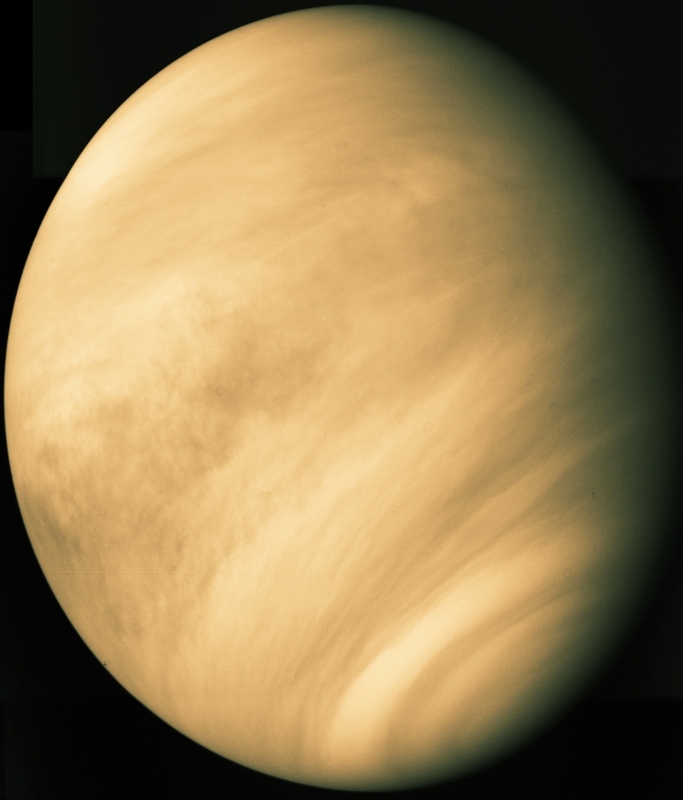 Venus had the misfortune of ending up too close to the Sun. It has a hellish landscape of nearly 900 degrees F, and 90 times the Earth’s atmospheric pressure. Its clouds consist of sulfuric acid. Talk about a runaway greenhouse effect and acid rain… Credit: NASA. Ephemeris for Wednesday, April 17th. Today the Sun will be up for 13 hours and 34 minutes, setting at 8:30, and it will rise tomorrow at 6:53. The Moon, 2 days before full, will set at 6:53 tomorrow morning. Let’s look at the planets for this week. Mars will be in the western sky this evening, above the V-shaped stars of the face of Taurus the bull. It will set at 12:23 a.m. In the morning sky we have Jupiter, in Ophiuchus, which will rise tomorrow at 1:07 a.m. in the east-southeast. Saturn will be next to rise at 2:54 a.m., also in the east-southeast. It is in Sagittarius. Venus will rise at 5:56 a.m. again in the east-southeast. By 6:30 in the morning they will be strung out from the south down to the eastern horizon. Venus will remain in our morning sky, though more difficult to see until August when it passes behind the Sun to enter the evening sky. Tiny Mercury may be glimpsed a bit left and just below Venus in the bright twilight. Mars and the Moon tonight at 9:30 p.m. April 17, 2019. Click on the image to enlarge. Created using Stellarium. The waxing gibbous nearly full Moon at 9:30 p.m. April 17, 2019. Created using Stellarium. Morning planets and Moon at 6:30 a.m. April 18, 2019. Click on the image to enlarge. Created using Stellarium. 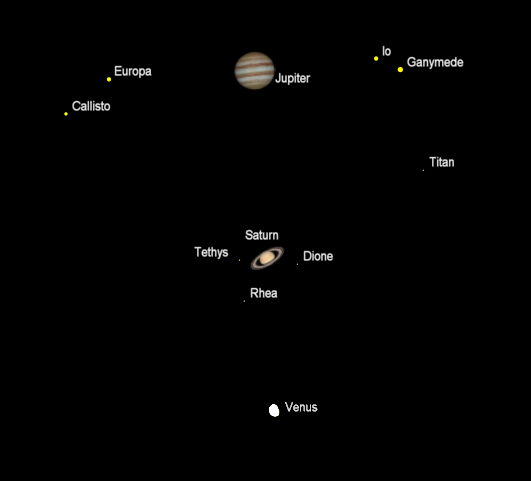 Jupiter and Saturn with the same magnification at 6:30 a.m. tomorrow morning April 18, 2019. Click on the image to enlarge. Created using Cartes du Ciel (Sky Charts). Planets and the Moon at sunset and sunrise of a single night starting with sunset on the right on April 17, 2019. The night ends on the left with sunrise on the 18th. Click on the image to enlarge. Created using my LookingUp program. Ephemeris for Wednesday, April 3rd. Today the Sun will be up for 12 hours and 52 minutes, setting at 8:12, and it will rise tomorrow at 7:18. The Moon, 2 days before new, will rise at 7:27 tomorrow morning. Mars in the evening at 9 p.m. April 3, 2019. Click on the image to enlarge. Created using Stellarium. 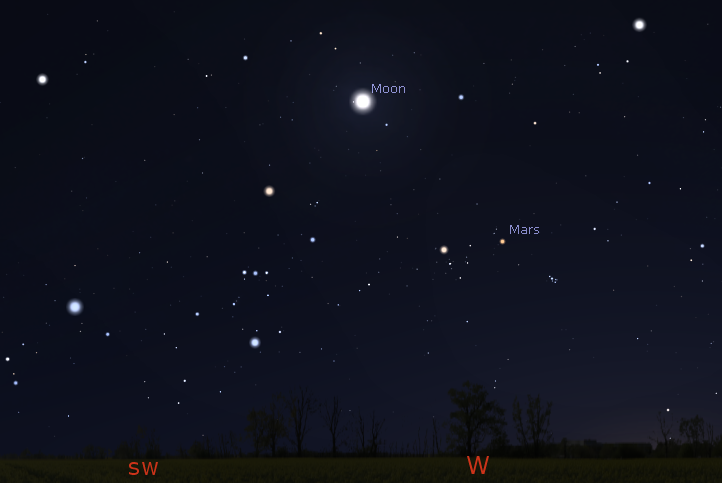 Morning planets at 6:45 a.m. April 4, 2019. Click on the image to enlarge. Created using Stellarium. 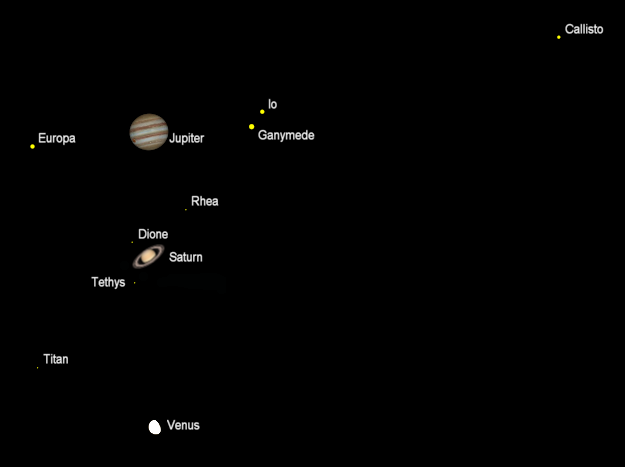 Jupiter, Saturn and Venus with the same magnification at 6:45 a.m. tomorrow morning April 4, 2019. Created using Cartes du Ciel (Sky Charts). Planets and the Moon at sunset and sunrise of a single night starting with sunset on the right on April 3, 2019. The night ends on the left with sunrise on the 4th. Click on the image to enlarge. Created using my LookingUp program. Ephemeris for Wednesday, March 27th. Today the Sun will be up for 12 hours and 30 minutes, setting at 8:03, and it will rise tomorrow at 7:31. 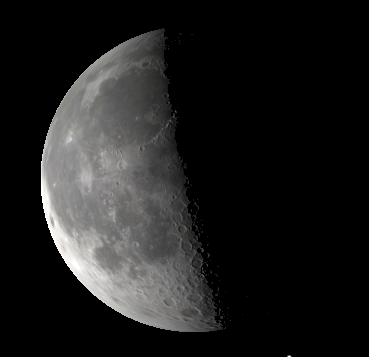 The Moon, 1 day before last quarter, will rise at 3:33 tomorrow morning. Let’s look at the planets for this week. Mars will be in the western sky this evening, below the Pleiades, or Seven Sisters, star cluster. It will pass to the left of the Pleiades Saturday night. Tonight, however, it will set at 12:34 a.m. In the morning sky we have Jupiter which will rise tomorrow at 2:29 a.m. in the east-southeast. It is second to Venus in brightness. Saturn will be next to rise at 4:14 a.m., also in the east-southeast. Venus will rise at 6:20 a.m. also in the east-southeast. By 7 in the morning they will be strung out from the southeast to the south, with the last quarter Moon between Jupiter and Saturn. The Moon will pass Saturn early Friday morning before it rises and will be seen then to the left of Saturn. Mars tiptoeing past the Pleiades nightly from March 26th to April 1st, 2019. Looking west. Created using Stellarium and GIMP. 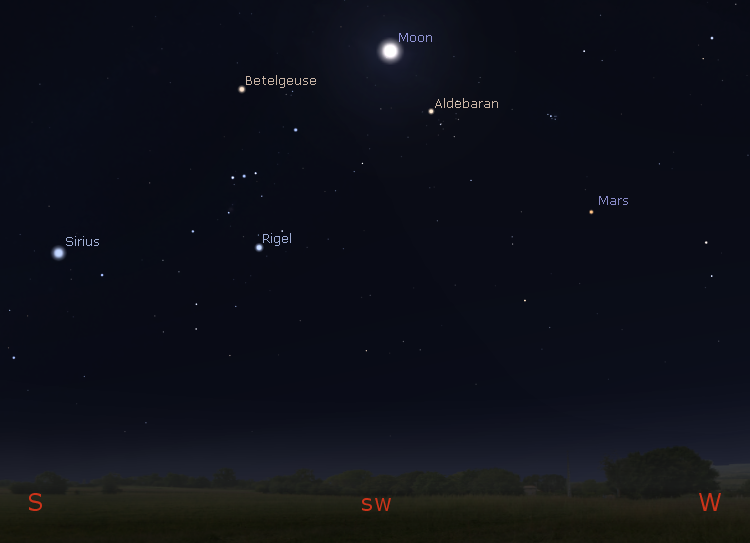 Morning planets and the Moons at 6:45 a.m. tomorrow March 28, 2019. Click on the image to enlarge. Created using Stellarium. 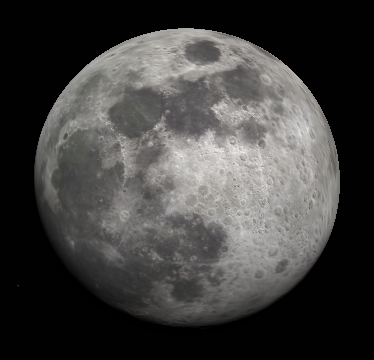 The moon as it might appear in binoculars tomorrow morning, March 28, 2019. Created using Stellarium. 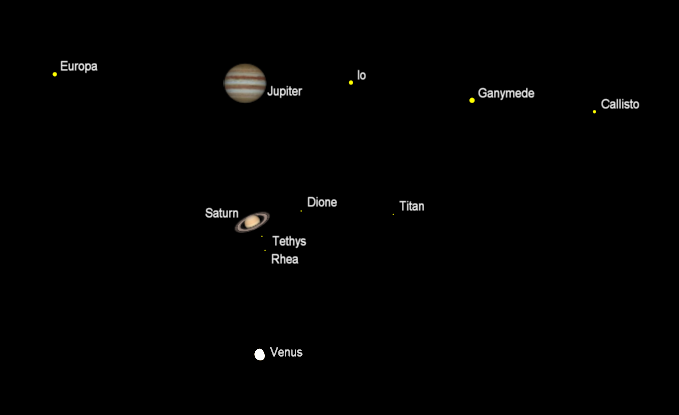 Jupiter, Saturn and Venus with the same magnification at 6:45 a.m. tomorrow morning March 28, 2019. Created using Cartes du Ciel (Sky Charts). Planets and the Moon at sunset and sunrise of a single night starting with sunset on the right on March 27, 2019. The night ends on the left with sunrise on the 28th. Click on the image to enlarge. Created using my LookingUp program. Ephemeris for Wednesday, March 20th. Today the Sun will be up for 12 hours and 8 minutes, setting at 7:55, and it will rise tomorrow at 7:44. The Moon, at full today, will rise at 7:35 this evening. Let’s look at the planets for this week. Looking down we see the Earth which will reach a point in its orbit at 5:58 p.m. (21:58 UT) where spring will start. 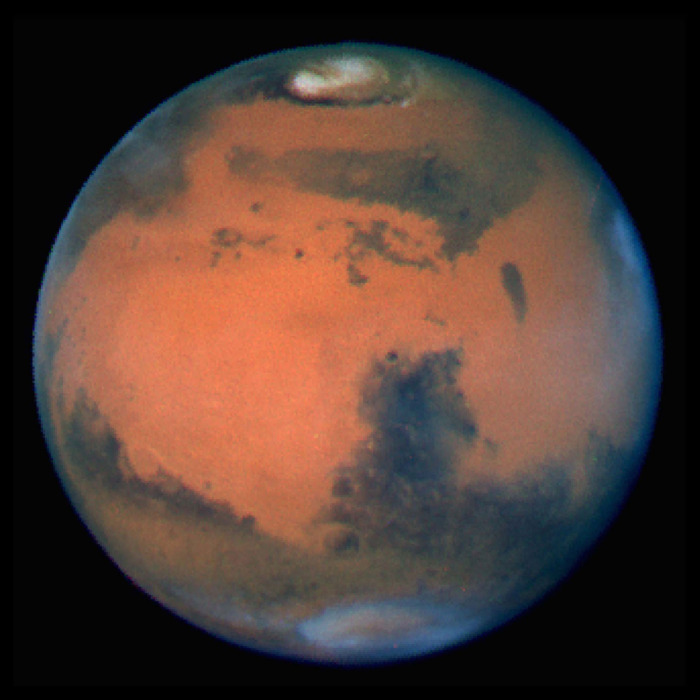 Mars will be in the west-southwestern sky this evening. It will set at 12:37 a.m. Mars is fading as the Earth, in its inner and faster orbit is leaving Mars behind. In the morning sky we have Jupiter which will rise tomorrow at 2:55 a.m. in the east-southeast It is second to Venus in brightness. Saturn will be next to rise at 4:40 a.m., also in the east-southeast. Venus will rise at 6:26 a.m. also in the east-southeast By 7 in the morning they will be strung out from the southeast to the south. They will be a beautiful sight as morning twilight advances. Mars and the Moon and the bright stars on the first day of spring at 9 p.m. March 20, 2019. Click on the image to enlarge. Created using Stellarium. The full moon, and super moon at that, at 9 p.m. March 20, 2019. Created using Stellarium. 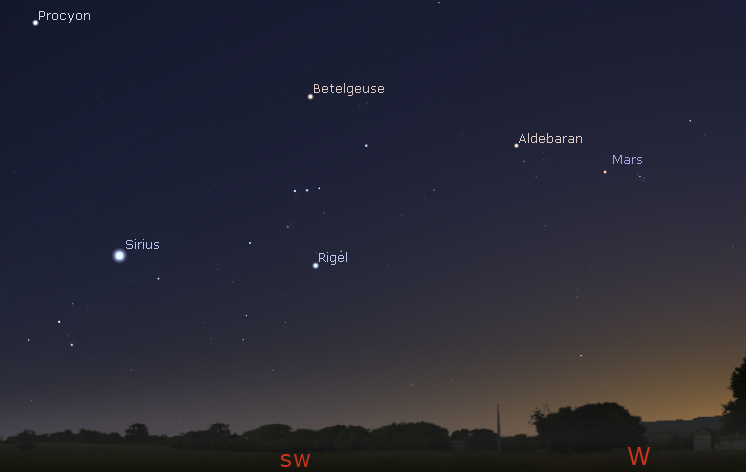 Morning planets and the constellations at 7 a.m. tomorrow March 21, 2019. Created using Stellarium. Jupiter, Saturn and Venus with the same magnification at 7 a.m. tomorrow morning March 21, 2019. Created using Cartes du Ciel (Sky Charts). Planets and the Moon at sunset and sunrise of a single night starting with sunset on the right on March 20, 2019. The night ends on the left with sunrise on the 21st. Note the motion of the Moon from sunrise and sunset. Click on the image to enlarge. Created using my LookingUp program. Ephemeris for Wednesday, March 13th. Today the Sun will be up for 11 hours and 46 minutes, setting at 7:46, and it will rise tomorrow at 7:57. 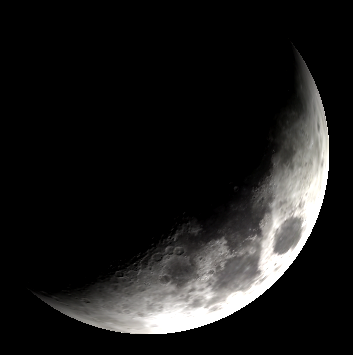 The Moon, 1 day before first quarter, will set at 3:06 tomorrow morning. Let’s look at the planets for this week. We are back to one evening planet visible now. Mars will be in the west-southwestern sky this evening and will set at 12:39 a.m. Mars is fading as the Earth, in its inner and faster orbit is leaving Mars behind at 175 million miles (282 million km) away. In the morning sky we have Jupiter which will rise tomorrow at 3:20 a.m. in the east-southeast It is second to Venus in brightness. 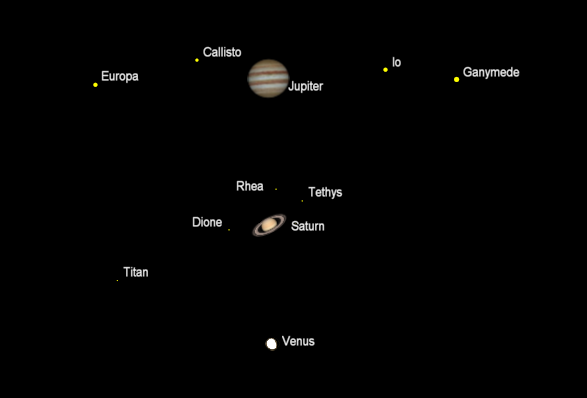 Saturn will be next to rise at 5:06 a.m., also in the east-southeast It will be to the upper right of Venus which will rise at 6:30 a.m. By 7 in the morning they will be strung out from the southeast to the south. They will be a beautiful sight as morning twilight advances. Mars and the Moon with the brighter stars at 9 p.m. March 13, 2019. Created using Stellarium. 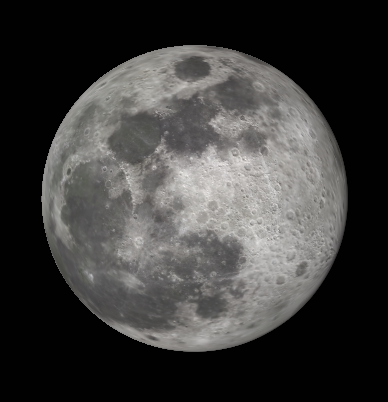 The Moon as it might appear in binoculars or a small telescope tonight at 9 p.m. March 13, 2019. Created using Stellarium. Morning planets and the constellations at 7 a.m. Tomorrow March 14, 2019. Click on the image to enlarge. Created using Stellarium. Jupiter, Saturn and Venus with the same magnification at 7 a.m. tomorrow morning March 14, 2019. Created using Cartes du Ciel (Sky Charts). Planets and the Moon at sunset and sunrise of a single night starting with sunset on the right on March 13, 2019. The night ends on the left with sunrise on the 14th. Click on the image to enlarge. Created using my LookingUp program.